The Mont (originally built as Seawise Giant) was the longest ship in the world. It was originally built by Sumitomo Heavy Industries, Ltd a japanese company in the period of 1974 - 1979. It has been through different names as it was owned by different companies in different periods. It was out of service since 2009. 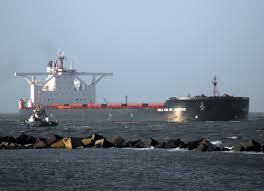 The ship was 458.45 m long and when fully loaded weighed 657,019 tonnes. It posses DWT of 564,650 which is the greatest deadweight tonnage ever recorded. In fact, because of her size she could not navigate the English Channel, Suez Canal or the Panama Canal. During 1991 at the time of Iran Iraq war the ship was sunk in shallow waters off Iran by a military jet. She was then salvaged and repaired and remained in service until 2009. Her final trip was to Priyablie Industries Ltd in India where she was scrapped.